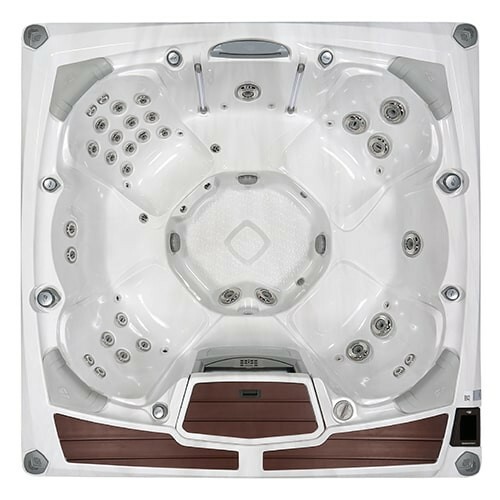 With seating for up to six adults, the evolutionary Odessa™ spa is wrapped in breathtaking cabinetry, and sure to change the way you use your spa. The crisp, rhythmic texture of the exterior cabinetry is showcased by illuminated corners that offer a touch of whimsy to the beautiful architecture. The spa’s low profile and wide, flat-top rail also houses a SunCooler™ cold storage area to keep beverages conveniently within arm’s reach. The upgraded Accu-Ssage™ therapy seat is a customer favorite, providing a deep-tissue massage via patented Fluidix® massage jets for full-body immersion and relaxatoin. Simultaneously soothe your muscles and senses with specialty Silent Air® injector jets and SunScents™ Aromatherapy for complete relaxation in your own backyard. The glowing Glass i-Touch Control allows you to enjoy your spa day or night with simple icon-driven menus, and is compatible with the SmartTub™ app so you can monitor and manage your spa from anywhere at any time. Best of all, CLEARRAY® UV-C Technology, a quick-drain feature, and the advanced MicroClean® Ultra Water Management System ensure that maintaining your spa is always a breeze.